KIA STINGER REVIEW – IT LIVES UP TO THE HYPE! The Kia Stinger has arrived after much fanfare in Australia, and when we say fanfare, never before have we seen such hype for a Kia. Let’s be honest, the Sportage hasn’t exactly got headlines across publications (not even motoring ones) when it has been updated. If you missed it (and if you did, where were you? What were you doing? Let us know in the comments below, actually, keep it clean folks, only tell us if it makes for family reading!) here’s a recap of some of what we saw going on with this car before it got Down Under. Firstly was the rumour, and the on going chatter that the Stinger was going to be the next car to enter the Virgin Australia Supercars Championship, one website even went to the extent to get some drawings done of exactly how it would look, and we like it… a lot. Take a look here. Finally, from a Dads Stuff point of view, we were snooping around Kia HQ in Sydney one day and spotted one of the first Stingers to be seen here. 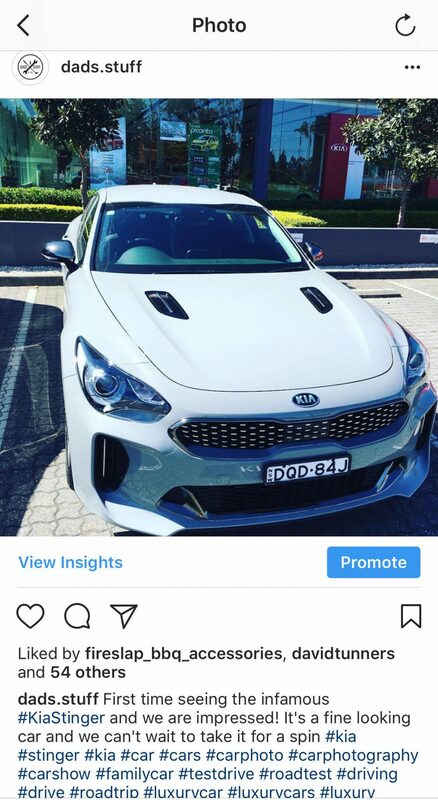 We snapped a photo, and it’s reach across Social Media was outstanding, and reinforced to us exactly how much hype and attention the launch of the Kia Stinger was getting here in Australia. So, we booked in for a test drive! This was perhaps one of our most anticipated test drives for a while, not only because of the hype, but also because the car looked and sounded like a genuine beast. It’s a complete change from the norm you expect from this Korean car brand… with people carriers and SUVs being the main models you see from then on the road. The Stinger was different, the Stinger IS a car that turns heads. It turned ours, and that’s before we even started her up. We were handed the keys to one of the base models, the 200S, with a price of just over $45k (plus on roads) which to be honest, is a steal. Our first impressions were the size and sleekness (is that a word?) of the car. It may sound silly, but to us, it looked like a super yacht. Low, sleek designs, long front end and with curves that looked sensational from every angle. For those of you who like detail, the Stinger measures in at 4.8 metres long. Surprisingly, for a sporty looking hatchback, that does translate to some decent boot space. You know how we love that here at Dads Stuff… remember how we managed to fit the golf clubs and the pram into the back of the Ford Mustang? If not… take a look here. 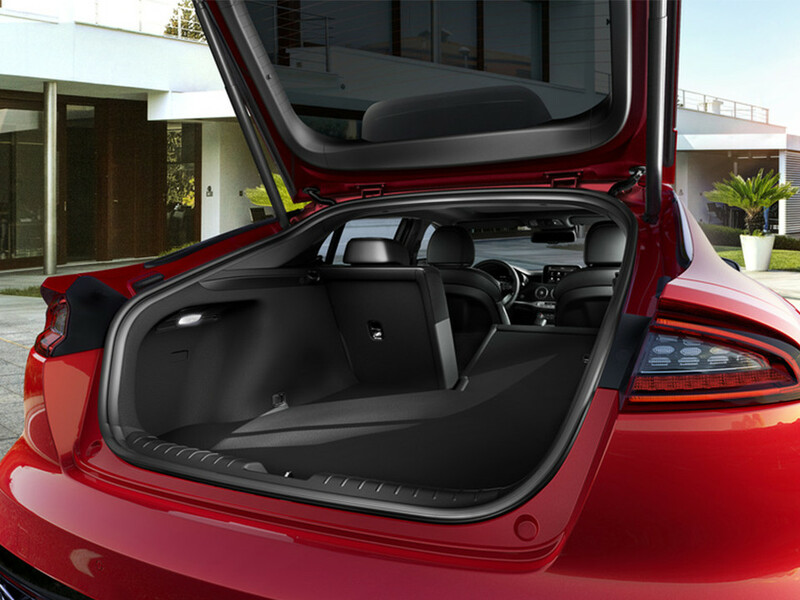 The Kia Stinger has 408 litres of boot space, which is more than enough for the everyday family essentials, You can also extend that by dropping the back seats down, which is of course very helpful in any car. The interior is stylish and sporty, we loved the sports seats and the outlook it gave you from the driving position. It was low and felt quick, but the vision you got was good, and in no way hampered by the size of the car or the position you were in. It has a luxurious feel to it, and it is the sort of car you actually look forward to getting into, even if you are about to tackle the Sydney Harbour Bridge in rush hour! The drive, what can we say about the drive, well to be honest, there’s nothing we can’t say that isn’t good. We’re not going to deliver all the tech specs and tell you how much power the Stinger delivers, you know it’s not our style. If you want that info, you can click here. We loved cruising around the city in his, it was at home in the traffic, it was awesome on the open road, and we can only imagine what it would be like to drive on track. That is something we would LOVE to do… hint hint Driving Solutions & Kia Australia! One of the great things about Kia is it’s seven year, yes SEVEN YEAR Warranty Programme, and the Stinger comes with this too. Seven years is a long time, especially when it comes to cars. To get this on such a high-performance car like the Stinger is a massive plus. Well done Kia. 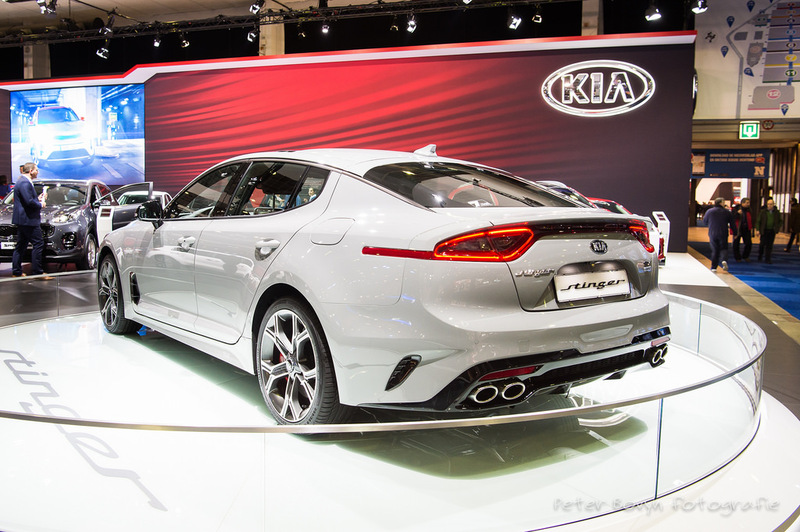 So to summarise, we love the Kia Stinger, we love the price of the entry level model, and we also love the fact the top of the range model is also affordable for the type of car you are getting (approximately $60k top of the range). We also love the hype that surrounds this car, we’ve never seen it for a Kia before, and we hope it continues. Finally, we love the little tune that all Kias play when you turn them on, if you haven’t heard it, do yourself a favour… book yourself in for a test drive and you never know, you might walk away with a new car. If it’s a Stinger, you’ve chosen well.